The global bio-MEMS (micro-electro mechanical systems) market is consolidated as few players hold approximately 45% share in the market, observes Transparency Market Research. Baxter International Inc., Medtronic, Becton Dickinson, Boston Scientific, and Abbott Laboratories holds maximum share and dominates the competitive landscape in this market. Leading players in the market are engaged in extensive research and development activities and focusing on developing new product. To maintain their position, players are also focusing on collaboration, mergers and acquisition, expansion, and innovation. 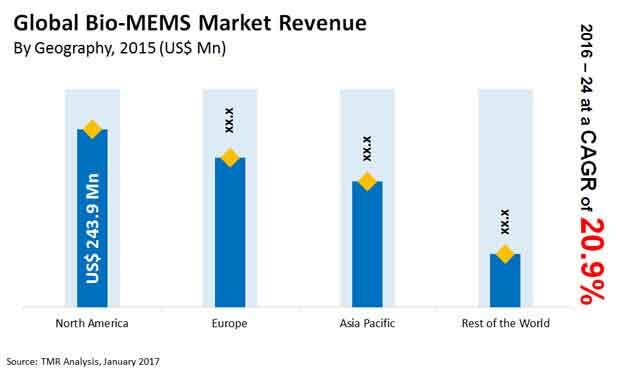 According to the TMR’s analysis, the global bio-MEMS market is projected to witness rise at 20.9% CAGR between 2016 and 2024. If the market grows at this rate, there are higher chances that the market valuation will reach US$ 3.8 bn by 2024. In 2015, the market earned US$0.69 bn. These growth rates are related with the increasing demand for accelerometers that fall under various types of bio-MEMS technology. Demand for accelerometers is high as it is widely used in the medical sector. The other sector that includes flow sensors is also expected to rise considerably in the coming years. These factors will provide a fillip in the global bio-MEMS market. Significant growth in mobile care applications is acting as key growth factors in the global bio-MEMS market. The demand for bio-MEMS technologies is widely seen in biological or biomedical purposes. Widening usage of microfluidics especially microfluidic chips in biomedical application for diagnosis and analytical purposes is also projected to drive demand for bio-MEMS. Moreover, growing demand for substitutes for a specific nerve problem or artificial limbs has further augmented demand in the global bio-MEMS market. Adding further to the growth, the growth drivers in the global bio-MEMS market is the rising developments taking place in clinical diagnostics. Use of advanced microfabrication techniques that are employed in bio-MEMS technology have resulted in treating critical diseases. Additionally, bio-MEMS sensors including topical sensors help in treating terminally ill patients, which further increase growth prospects in the global bio-MEMS market. Though there are multiple growth factors augmenting demand in the global bio-MEMS market, few restraining factors might hamper growth in this market. High implementation cost of bio-MEMS technologies by some organizations can deter demand in the global bio-MEMS market. Additionally, limitation with fabrication techniques and difficult manufacturing process are other challenges hampering growth in the global bio-MEMS market. But the growing demand of microfluids, the global bio-MEMS market can see an up take in the forthcoming years. Benefits of using bio-MEMS technologies that helps in quick detection of pathogens and bacteria could expand adoption of bio-MEMS technologies. The study presented here is based on a report by Transparency Market Research (TMR) titled “Bio-MEMS Market (Type - Gyroscopes and Accelerometers; Application - Neural Implants, Bionics, ENT Implants, and Cardio-MEMS) - Global Industry Analysis, Size, Share, Growth, Trends and Forecast 2016 - 2024”.